Documentary The Sacred Triangle: Bowie, Iggy & Lou 1971-1973 is a feature-length examination of the unique and creative relationship between respected rock stars David Bowie, Iggy Pop and Lou Reed when their paths and musical styles crossed in the early 1970s during the glam rock era, a time when the seeds of punk rock slowly began to sprout. 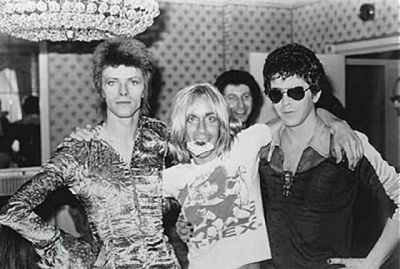 Meeting in 1971 in and around New York City’s famed Max’s Kansas City music venue and collectively aping/borrowing/inspiring each other’s styles — Bowie’s artfulness, Iggy’s thrashing and Lou’s rich musicality — the three musicians each emerged re-energized and poised to take on new directions in sound and vision. That they each worked on or produced each other’s records for a time didn’t hurt either. The movie has a bunch of great vintage music clips (Bowie’s performance of “Starman” on British TV is particularly affecting), some film footage and a whole slew of even better archive photos that captures a Lower East Side that is truly long gone. Ditto for the eclectic mix of talking heads who offer their two cents, ranging from the silly (Angela Bowie) to the sublime (music manager of the era and former Warhol-ite Leee Black Childers). Though it’s a bit overlong, The Sacred Triangle smartly gives each artist a fair amount of individual time, most illuminatingly on Bowie, who was going through his whole Ziggy Stardust and bisexuality thing back in those years. It also offers an interesting mention of Bowie’s friendship with T’Rex’s Marc Bolan, a glam rock icon in his own right and a musical talent who certainly would have expanded the triangle into a square (quartet?) had he not died several years later. Unfortunately, the DVD doesn’t come with special features (some additional performances wouldn’t have hurt), but the program itself remains worth a look.